I knew that I would feel anxious about implanting, but I actually feel terrified. I feel like I’m going to cry from the fear. I also feel warm and happy, having J’s embies back inside of me where they belong. I feel like I’m holding my breath. This morning when I woke up I spent some time praying, asking for our embies to hatch successfully, to burry in, and to stay. I visualized this happening. I feel so much more connected to them than I did the first time, probably because I felt close with my fetus who didn’t make it, and have had four more months to think about them, four more months to see us as moms, four more months to understand that these last two embies are so loved and depended on. Tonight I’ll post a brief story of our transfer with some pictures. I’ll have extra time after work now during the time I usually work out for an hour. It is very daring to have hope when odds are slim and you’re already fighting bitterness. One of my brave clients shared in a therapy group this week that without hope, she would still be using crack and wouldn’t be surrounded by strong, loving people at the clinic. I want to learn from her, someone who has lived in a Hell I’ll probably never know. I will have faith today, I will be grateful, and I will honor this beautiful chance at life by giving it hope. I was shaky and nervous when we arrived at the clinic. Since I forgot my water bottle at home I bought a nice bottle of Evian in the office building cafe. Only the best for my “baby”! Our doctor called us into her office and reviewed our embryos. It was pretty heart-wrenching to see the list of each embryo and how they did. The embryos at the top had survived and their development was coded, but a line down the page where the other fertilized eggs had been just said “disposed.” It was weird. Or doctor explained the development of each embryo. We had two in really good condition, not “As” but “Bs” she called prime. They are going to continue watching four more and we will possibly have 2-4 to freeze. When I first found out there were only two good ones I freaked out a little inside. 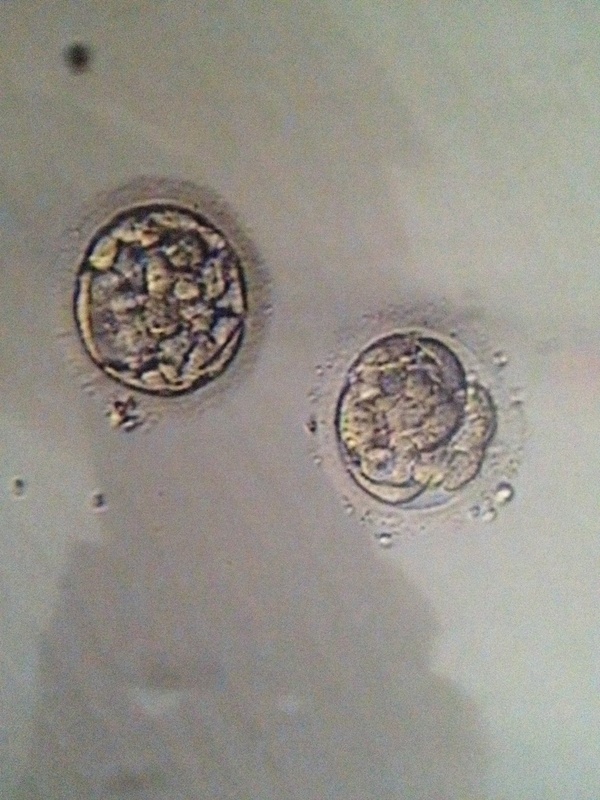 Our doctor explained why she recommended two embryos based on J’s eggs and the development of the embryos; if they weren’t well-developed she may have recommended three, or if we were younger, one, but as it was we followed her rec and transferred two. Our clinic has a 48% success rate in our age category. If we transferred only one, the chances of pregnancy drops to 18%. However, with two, the chance of twins is 20%. Neither of us wants twins but our doctor explained that it is never her intention to give anyone twins, her intention is one healthy baby, but that having to go through another cycle can be very difficult emotionally. When we got to the room my bladder wasn’t quite full so they had me drink more water and checked my bladder on the ultrasound to see if it was getting full. Around the time the Valium started kicking in, a magic cubbyhole door in the wall opened and our embryologist stuck her head through and introduced herself! It felt surreal, her showing us the lab through the cubbyhole, the incubators, and handing us a picture of our embryos. Then our doctor, who is a fabulous female fertility queen, came in. I felt the catheter go through my cervix – tiny ouch – but J was holding my hand and I was happy and relaxed from the valium so it wasn’t too bad. We watched on the screen as the catheter released the embryos. J took a video of it, which was our doctor’s idea, but I can’t get the video to save into this post. The embryos looked like a tiny shooting star falling into place! As soon as it was over I started crying. I was so happy and couldn’t believe it was happening. J said later that she almost cried too but kept it together so we could hear the aftercare instructions. The biggest surprise today was that my BETA is in ONE WEEK!! WWWHHHATT?! I thought it was a two week wait! Our coordinator explained that since we transferred a 5-day blastocyst, my first blood pregnancy test will be next Tuesday June 10th, then the second June 12th, and if I am pregnant, the final one June 19th. I’ve been preparing for the long haul and I’m flabbergasted that we have a test in only a week! J and I took a long nap this afternoon, then made a yummy dinner and watched a comedy movie. Supposedly laughing is good for post-transfer? It worked, we laughed! I also ate my pineapple and core, and the other four pieces are waiting in the fridge to eat each day to keep my uterus sticky. I’ll do whatever it takes! 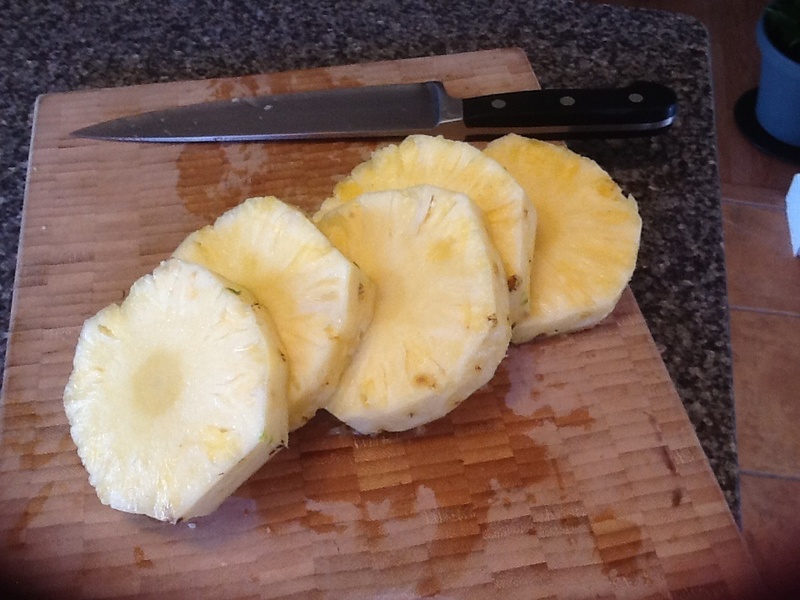 Plus this fair trade pineapple is amazing.